It seems like a creation of Arthur Miller, Ibsen, or indeed John B Keane: a ravaged island community, young zealous preacher and the established but impoverished priest obsessed with a fight for physical and spiritual survival. 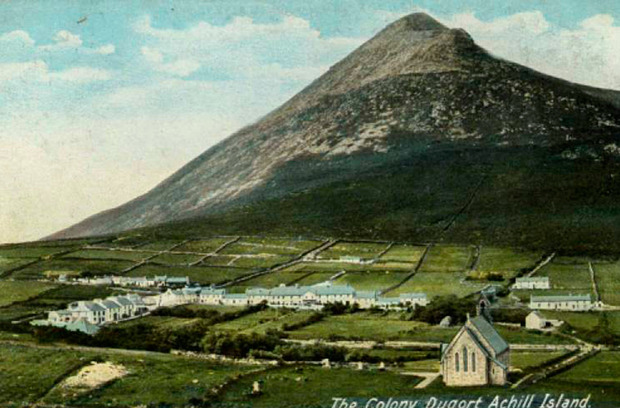 In the 1830s, Edward Nangle took his young family to Achill Island - a place that was a byword for barbarism, poverty and idolatry. It was one of the most destitute spots in Ireland jutting off the coast of Mayo into the Atlantic. Nangle's project was bold and daring. The evangelical clergyman wanted to transform the island and to lift the people out of their destitution which he blamed on Popery and the Catholic Church. He would bring the Bible to the islanders, using their native language. He would set up schools, reclaim land, bring medical services and encourage good living. He would civilise the island and scriptural education was his main tool. From the start of his enterprise, Edward Nangle locked horns with Archbishop of Tuam John MacHale. Two driven, larger-than-life, articulate men, each with his own version of the Christian truth, they traded insults and vitriol from pen and pulpit. Edward Nangle condemned the "odious practices" of Catholicism - "masses and purgatory and penances and pilgrimages", as well as the Eucharist "a bit of senseless, motionless paste". John MacHale could not watch on passively as Edward Nangle set up scriptural schools across Achill. He responded by establishing competing schools and made several provocative visits to the island. In the summer of 1835, in a splendid spectacle beneath Achill's Minaun cliffs, he addressed a large congregation. The archbishop roared his condemnation of Edward Nangle, forbidding any interaction with the Achill Mission. Inevitably, the belligerent and sectarian animosity triggered by the mission led to tragedy. Today, immediately behind what remains of the colony buildings on the slopes of Slievemore, is a cemetery, Sean Reilig, where the grave markings are barely legible. It was the scene of strange events on January 6, 1839, when the body of a man was exhumed from his fresh grave for an inquest. He was Captain Francis Reynolds, chief officer of the Achill coastguard and associate of Edward Nangle, who had been attacked in Keel several weeks earlier and died from his head injuries. After the inquest, when the people dispersed, the wind from the west began to grow in strength, exploding into a hurricane. It was the Night of the Great Wind, the most devastating storm recorded in Ireland which left several hundred dead in its wake. A decade into Edward Nangle's enterprise, the colony was thriving. He introduced recantations where converts publicly denounced the faith of their birth. Provocatively, he also infiltrated the ranks of the Catholic clergy, securing a number of high-profile recruits. But dark clouds were gathering. In early November 1845, local newspapers confirmed the dreaded news that the potato blight had reached Mayo and Achill Island. As pit after pit was opened, potatoes that had appeared to be sound oozed a sour-smelling liquid once touched. Edward Nangle reacted like a man unhinged, seeing "the finger of God" in the rotting potato crop. His physical and mental health had been precarious since his youth. He endured symptoms of what would now be termed bipolar. With the onset of the Great Famine, his health crumpled. Despite this, he was able to marshal huge resources through his fundraising, mainly in England, for the Achill Mission. The colony organised employment schemes; medical services were delivered; shiploads of corn were secured for the colony and the island. And Edward Nangle made a decision to provide food for the children attending the Achill Mission schools. What appeared to be a humane gesture was soon embroiled in controversy. The nasty charge of ''souperism'' - securing converts with material benefits like food - was levelled at him. "Nangle the soul-buyer" was the accusation. Edward Nangle retorted that no children were admitted to the colony schools unless they were willing to receive religious instruction, but his schools had saved many from starvation. "The poor children receive two meals of wholesome food each day, by which hundreds have been saved from death by starvation." Yes, the Achill Mission almost certainly saved many from famine death. But did it shamefully exploit a vulnerable people in their hour of need? After the Great Famine years, all changed in Achill. Death and emigration had taken their toll and whole villages were deserted. And the two militant clergymen, Edward Nangle and John MacHale, were about to become ecclesiastical landlords. The archbishop acquired lands at Bunnacurry which became a Franciscan monastery with a school and farm. Edward Nangle bought part of Sir Richard O'Donnell's estate from the Encumbered Estates court. He would face charges of "driving out the people" from their land as preference was given to those who conformed to the Achill Mission principles. Today, Edward Nangle's remains at rest in Deansgrange Cemetery, Co Dublin. His headstone has toppled from its perch and rests, slightly raised, on a concrete ledge. No sounds of the Atlantic waves here, nor Achill winds - a quiet resting place for a man who lived a tumultuous life.